These items are a way for me to make it easier for people to get involved with the homebrewing hobby while generating a minimal income that I use to buy parts and such for my own use. As I am doing this mainly as a hobby and service to the community, the return policy on these items is tricky. In general, neither you nor I want to deal with returning parts that you didn't want, so please make sure you want what your order. If you need to return something because it is broken, contact me to make arrangements and likewise I will try to accomodate non-defective returns as best as possible. Interested in TONE BREWERY PSM's or MODULE PARTS? Contact me so we can see what you're after! 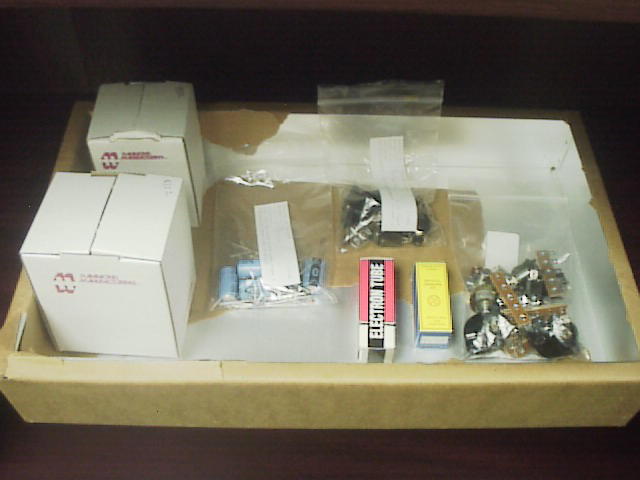 Parts kits include just about everything you'll need to build the amplifier listed. That means resistors, caps, pots, sockets, jacks, switches, tubes, transformers and terminal strips. These kits come with diode rectifiers rather than tube rectifiers by default. These kits come by default with a Hammond 16x8x2 unpunched aluminum chassis suitable for drilling, nibbling or dremel-ing. I can also supply these pre-punched, in a different size, or not at all. Please contact me for details. These kits include only parts, not comprehensive directions for building the amp in question. 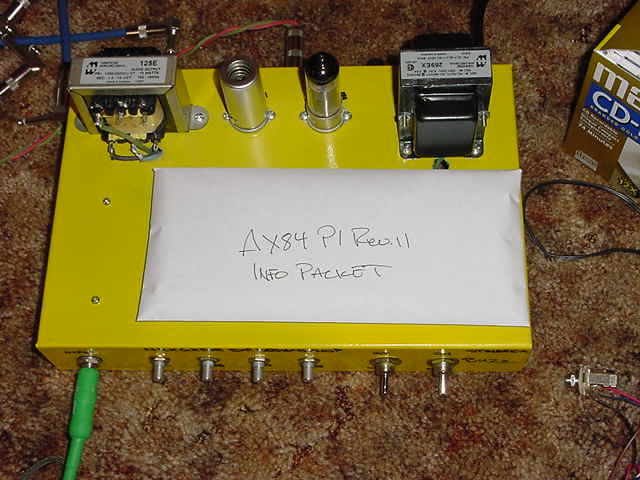 Feel free to visit the AX84 website for schematics and pictures of the inside wiring produced by other people. Also, while I have found that that parts I supply in these kits work well, advanced builders may have their own preferences. For this reason, I do not expect to be providing kits for the November or other advanced projects. These kits DO NOT include a speaker, solder, wire, cabinet (i.e. head or combo enclosure) or external cables. I am now offering the service of pre-drilling the chassis for the transformers, pots, jacks, and terminal strips to save effort for the builder. This is $50 for a P1 or Hi-Octane. Save yourself some time and focus on getting the amp working... I am also contemplating offering mini-kits which include the resistors and caps, but none of the other stuff. The terms of sale: (A)Prepayment with Credit card payment via PayPal or (b) Prepayment via cashiers check. There is a flat $10 shipping charge to anywhere in the continental USA. (Kits not available outside the continental USA) Kits usually ship in 1-2 weeks, but you may email me prior to ordered to get an idea how we are doing. 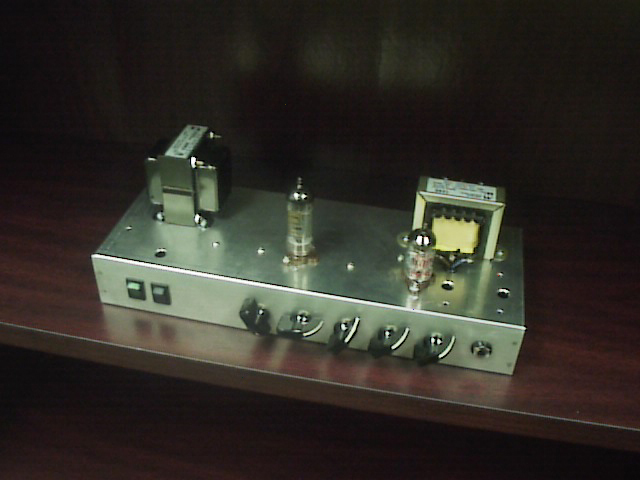 AX84 P1 Amp Kit $175 March Special! Hi-Octane Amp Kit $185 March Special! It normally takes me a few weeks from start to finish to build someone an amp. I require a 50% deposit prior to construction. When the amp is done, I supply pictures and an audio clip for your review. Assuming that there is no problem, the remaining 50% plus $10 shipping is required prior to shipment of the amp. I guarantee that the amp will work when you get it, barring damage during the shipping process. If it does not, or develops a problem within thirty days, I will make every effort to correct it, provided that its not caused by misuse. Like parts-kits, pre-builts are only available to residents of the continental USA and PayPal is the preferred payment method. 50 Watt Push-Pull EL34 Hi-Octane $405 Ready to ship! If anyone is interested in this, drop me an email note at chrish@ax84.com. 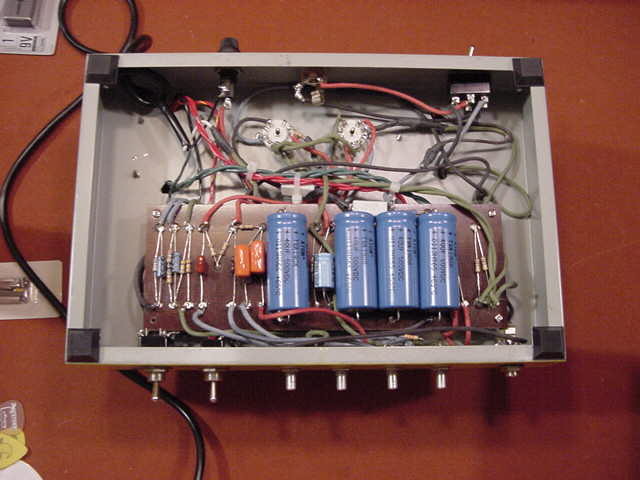 I welcome comments from other folks who would like to offer parts kits or pre-built amplifiers. Chris, I just wanted to drop you a note to tell you how much I love the P1 you built for me. I'm surprised at the various tones I can achieve just by switching different speakers. It's built very well, with plenty of room for expansion. Nice work. Maybe someday you'll rank up there with some of the other boutique amp makers, it looks like your on the way. Mr. Hurley, It is very hard for me to express just how impressive your expertise and professionalism are to me. In hearing the audio clip I am just astounded at your ability and look forward with great anticipation at engaging you in further projects. Thank you for your excellent communication and courtesy, if only as consumers we were surrounded with the likes of yourself there would be no fear in buying. I have friends who have been waiting to hear the results and this is really gonna "WOW" them. Thank you so much again for such an awesome command and ability at providing the public with such remarkably admirable and noteworthy service. You will definately be hearing from myself again soon.